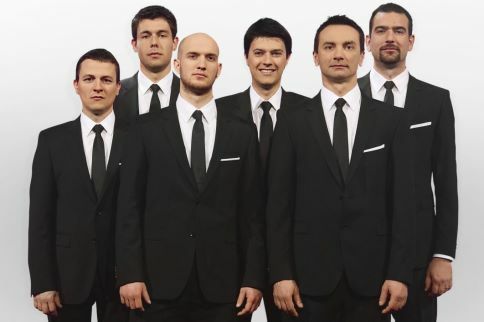 Klapa singing is a traditional Croatian form of vocal music originating from Dalmatia, in southern Croatia. In December 2012, UNESCO inscribed klapa singing on its list of world intangible heritage of Europe. This year Croatia has formed a special klapa for the Eurovision Song Contest made up of singers who are young, but rich in experience. Marko Škugor was born on October 25th, 1989. He had a lovely childhood in Dubrava, near Šibenik where he lived with his parents and two younger sisters. After graduating from the secondary school in Šibenik he went on to study at the Faculty of Economics in Zagreb. He has only four exams and the final examination left. He started singing in a klapa only a little over two years ago, when his cousin persuaded him to give it a try. He is now a member of the Kampanel klapa and his dreams are not related to economics but to opera. He has been taking singing lessons with the former lead singer of the Zagreb Opera, Stojan Stojanov. Ante Galić was born on September 3rd, 1987 in Split. He grew up with his mother and spent a lovely childhood filled with the usual mischief, football and basketball. He took up football at the age of seven and this was the reason he didnt enter a university. He played for minor league clubs: Junak, Hrvace, Radnik from Velika Gorica, but his career was brought to a halt by injury. He got involved with singing by accident. On some party a singer from the klapa Cambi happened to hear him and was delighted with what he had heard. The next logical step was multipart singing in the Sinj klapa, since he lives in the small town of Turjaci near Sinj. Nikša Antica was born on May 9th, 1976 in Split where he had a happy childhood living with his parents and his younger brother. Nikša completed his entire education in Split, where he also earned a law degree. He came to Karlovac when he married a local girl, and now considers this his home town. Although he works in a bank, his career in music is very extensive. After children’s choirs and the Brodosplit men’s choir, between 1996 and 2002 he was a member of the Split Croatian National Theatre Choir and took singing lessons with Professor Marija Bogaverdes. He sang in the following klapas: Šufit, Cambi Kambelovac, Iskon and Sagena. He has been a member of the Kampanel klapa for seven years now. Leon Bataljaku was born in Zadar on June 13th, 1980. He had a happy childhood, which he shared with his younger sister. He completed elementary music school, majoring in piano. After graduating from the secondary school in Zadar, he studied at the Faculty of Economics in Rijeka. It was there that he met the guys from Rijeka and Crikvenica with whom he formed the Crikvenica klapa in 2001, and went on to successfully perform in it until 2009. Today he sings for recreation, as he put it, in the Niko klapa from Zadar, which does not have any big ambitions but they did perform several times in their hometown. He lives with his wife and two small sons. Ivica Vlaić was born on July 12th, 1979 in Šibenik. He grew up with his parents and a younger brother. He graduated from high school and entered the Faculty of Maritime Studies, but didnt get a degree there because he started working for the Croatian Army. Six years later he transferred to the Naval Police station, where he now works as a naval policeman. Sometimes he stays out in the field for four days at a time. He spends those days on a ship, where he cooks and cleans, and works 12-hour days, occasionally even 24-hour days. He is a basketball aficionado: he used to play in Šibenka until he was 19. He entered the world of klapa multipart singing in 2000, by complete accident: “Five friends gathered and founded the multipart singing klapa Teuta.” Their only motive was to spend some time together, but that didn’t stop them from winning festival awards. Today he sings in the Sebenico klapa and lives with his wife and little daughter. Bojan Kavedžija was born on June 14th, 1973 in Zagreb. He spent a happy childhood with his parents and his sister. He graduated from high school for tourism management, but never worked in his field of expertise. One summer on the Murter island he met five girls who sang and danced in a folklore group. They persuaded him to join them and so he spent two years as a dancer in the folk dance ensemble Venčec from Dubrava. Afterwards he was accepted into the National Folk Dance Ensemble Lado and with them he travelled literally around the world. As a dancer he already performed on the Eurovision stage in 2006, when he appeared with Severina. He sings in the Grdelin klapa. He is not married. Goran was born on 29th June 1975 in Karlovac. He lives and works in Duga Resa, where he went to school. He graduated from elementary music school in Karlovac, where his instrument was the piano. His first appearance was in 1989 at Glas Mladih (Voice of Youth), a festival of amateur singers in Duga Resa, where he, with the group Amsterdam, took the jury’s third prize with his own song. He went into the studio for the first time in 1993 to record the first song he had ever sent in to any contest: the Split Festival, highly respected in Croatia. Afterwards he began to work more intensively on composing. At the end of the 90s he met the distinguished Croatian pop music composer, Zrinko Tutić, who directed and instructed him, pointing out his mistakes. Their reunion, a decade later, saw visible progress. He considers his first great success to be the song Ring Of Gold, which was performed at the Croatian Radio Festival of 2007 by Karlovac singer Željko Golik. In that same year, the same singer also performed his song I Die For You at the Herzegovinian Radio Festival. He entered the world of klapa singing thanks to Klapa Furešti (Foreigners). Some of the songs he wrote for this group also received awards, and the music videos of them are watched enthusiastically on local TV stations and specialised music channels.